Today’s networks have increasing numbers of devices attached to them, both wired and wireless. As wired devices proliferate, it can be difficult to easily and neatly place networked ports where you want them. NETGEAR ProSAFE Click Switches address this issue with an innovative and thoughtful hardware design, including the flexible Virtually Anywhere Click mounting system. NETGEAR ProSAFE Web Managed Gigabit Ethernet Click Switches are uniquely designed with an industry-first, bracket mounting system for easy installation. Available in either 8-port (PoE and non-PoE) or 16-port configurations, their slim design and internal power supplies enable you to organize wires, secure cables, eliminate bulky power adapters, and improve the overall appearance of wiring closets, training facilities, lab benches, conference rooms, and even home entertainment centers that require multiple connected devices. Simple to use mounting bracket enables vertical or horizontal orientation of ports. To install, just mount the bracket onto a wall, desk, table leg/pole, or virtually anywhere, and "Click" the switch into the bracket. Today's networks have increasing numbers of devices attached to them, both wired and wireless. As wired devices proliferate, it can be difficult to easily and neatly place networked ports where you want them. NETGEAR ProSAFE Web Managed Click Switches address this issue with an innovative and thoughtful hardware design, including the "Virtually Anywhere" flexible 1-2-3-4 Click mounting system. The new ProSAFE Web Managed Click Switches are Gigabit Ethernet switches with an industry-first, bracket mounting system for easy installation. Available in either 8- or 16-Gigabit port configurations, their slim design and internal power supplies enables you to organize wires, secure cables, eliminate bulky power adapters, and improve the overall appearance of wiring closets, training facilities, lab benches, conference rooms, and entertainment centers that require multiple connected devices. The innovative 1-2-3-4 mounting system gives you the flexibility to place the Click Switch in locations where other switches will not go. Whether it’s directly on a wall, strapped to a pole, under the meeting table in a conference room or in a server closet, vertical or horizontal, the Click Switch’s unique mounting system allow you to control exactly how your ports and cables are deployed. The Web Managed Click Switches GSS108E (8-port) and GSS116E (16-port) feature an innovative and flexible mounting bracket, making it easy to mount the Web Managed Click Switches vertically and horizontally, on a wall, under a desk, or strapped to a pole, flat or perpendicular - allowing you to put your ports where and how you need them! Watch the video to the left for more information. The Web Managed Click Switches can go beyond plug n' play connectivity with additional ProSAFE Web Managed Switch networking features, allowing businesses to segment the network with VLANs or prioritize voice and video traffic with QoS. IGMP Snooping allows for optimized multimedia delivery and port trunking (GSS116E only) adds redundancy to uplinks and servers. Setup and configuration is simple using the web-based configuration GUI. Click Mounting System The innovative Virtually Anywhere mounting system gives you the flexibility to place the ProSAFE Click Switches in locations where other switches cannot go. 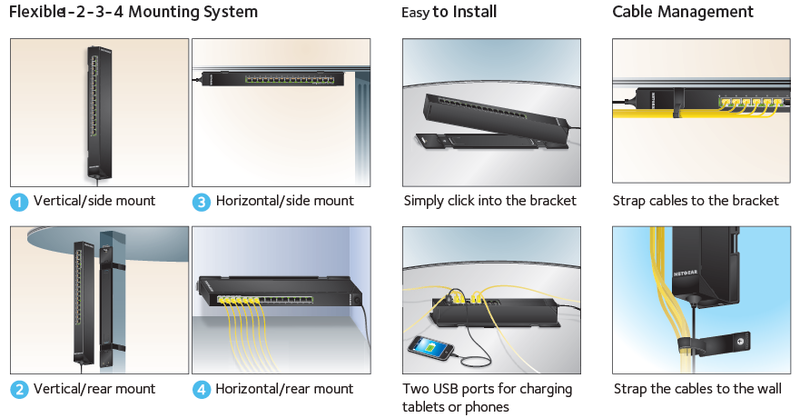 Whether it’s directly on a wall, strapped to a pole, under the meeting table in a conference room or in a server closet, vertical or horizontal, flat or perpendicular, the Click Switch’s unique mounting system allow you to control exactly how and where your ports and cables are deployed. Easy Cable Management Multi-directional power cable can be routed outwards or to suit most any mounting needs. Ethernet cables can be strapped to the bracket or mounting surface using the provided retaining strap. 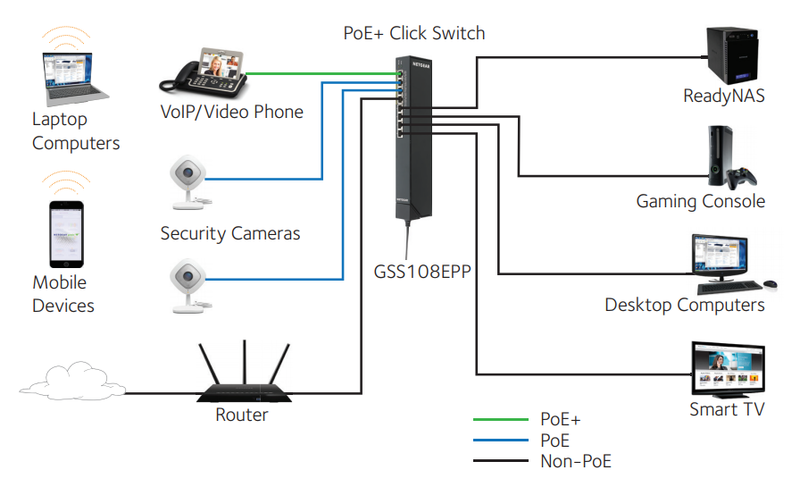 PoE/PoE+ support (GSS108EPP only) Power-Over-Ethernet (PoE) option available for powering IP Security Cameras, VOIP phones, wireless access points, and other PD-powered devices. 4 PoE+ ports (47W total) ) allows connection of up to 4 PoE/PoE+ (802.3af and 802.3at) devices and 4 additional non-PoE devices. USB Charging ports (GSS108E only) The GSS108E features two conveniently placed USB ports for users to charge their smartphones and tablets. 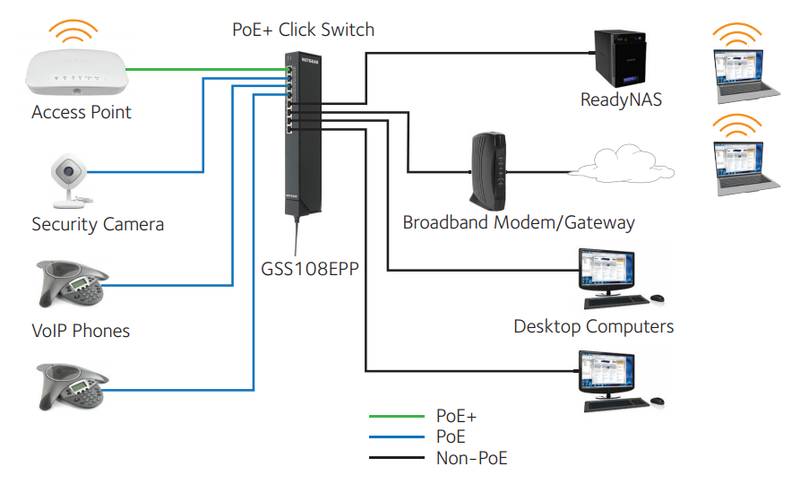 Port trunking/Link Aggregation (Static Manual LAGs) (GSS116E/GSS108EPP only) Build up bigger bandwidth to support aggregated uplink/downlink traffic or to provide redundant link(s) using Static Manual LAGs. Voice VLAN (GSS108EPP Only) The feature enables auto assignment of voice traffic (based on OUI) to a special VLAN (AKA Voice VLAN), allowing the assignment of special QoS parameters to that traffic, and tagging the port automatically, giving it high priority services. Voice VLAN must be enabled on a per port basis. Loop detection and auto-DoS prevention (GSS108EPP and GSS116E only) Detect accidental network loops and protect against DoS attacks. Download the NETGEAR Click Switches Datasheet (PDF).